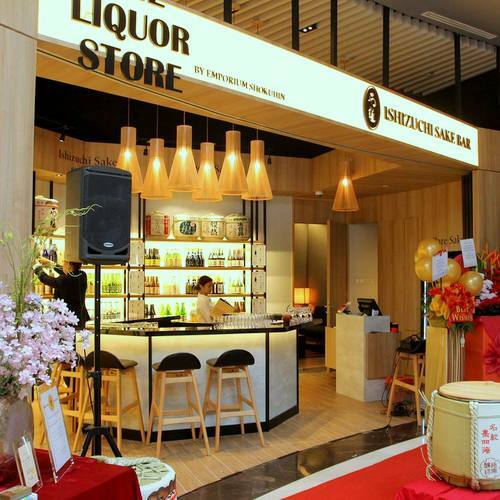 Ishizuchi Sake Bar by Emporium Shokuhin is located within Singapore’s Marina Square, at 6 Raffles Boulevard. The sake bar is a partnership between Emporium Shokuhin group and one of the most famous sake makers in Japan’s Ehime prefecture, Ishizuchi Sake Brewery. Visiting the sake bar, you can enthusiastically say ‘kampai!’ to the great selection of the finest sakes from Ehime and other Japanese prefectures. Furthermore, you can pair your delicious sake with the sake bar’s delectable Japanese tapas for an unforgettable evening. Ishizuchi is part of Emporium Shokuhin group’s dining concepts that range from Live Seafood Market Dining to Takujo Japanese Dining, Gyuu+ Yakiniku Grill, Umi+Vino Seafood Wine Bar, S habu Tan Japanese Hotpot, Senmi Sushi Bar, Burosu Honten Gyoza & Ramen, and Kohi-Koji Café & Bakery to Kome Kome. The official Facebook page for Emporium Shokuhin, which owns half of the Ishizuchi Sake Bar and manages its operations, is located at www.facebook.com/EmporiumShokuhin/. Emporium Shokuhin’s Facebook page is a great resource of information on all of their dining concepts and promotional offers at these establishments.